With a few notable exceptions, the rules for starting a successful and profitable Fiverr business really aren’t that different from starting a traditional, brick-and-mortar business. Perhaps the two greatest advantages that Fiverr offers is that there are zero barriers to entry for a young entrepreneur looking to penetrate into a market, and start-up costs for a creating a new business are almost non-existent. With that stated, not all Fiverr businesses are created equal, and just like with any other internet-based industry, the burnout and failure rates are also incredibly high. Here are five tips to ensure you don’t become part of that statistic. I) Drastically shorten the “Noob Stage” of your Fiverr business by doing intensive advertising on social media sites. 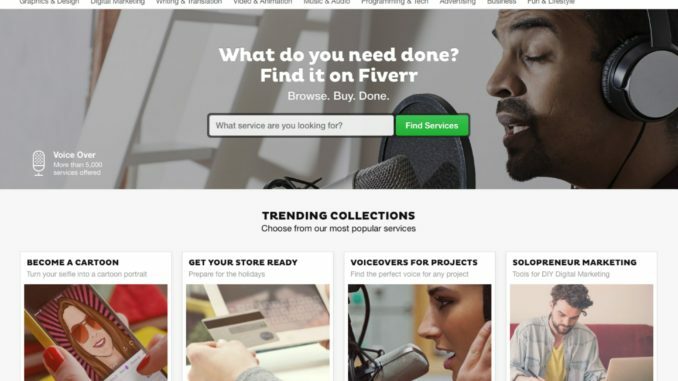 One of the principle reasons people give up on Fiverr is that business can be incredibly slow when you first sign up and are trying to build both a customer base as well as a solid reputation. A common sense tactic to help shorten this non-profitable time period is to yoke every social media resource you have at your disposal such as Facebook, Twitter, LinkedIn, Pinterest, StumbleUpon, professional networks, college alumni networks, and your personal blog. Couple the launch of your Fiverr business with a massive marketing and advertising campaign in order to ensure that you hit the ground running as a Fiverr entrepreneur. II) Much like with resumes, valuable gigs often go to Fiverr sellers that have the most eye-catching pitch and presentation. As stated, one of the reason’s why Fiverr is so popular is that there are zero barriers for entering into an industry and the start-up costs are almost non-existent. But the rules of market competition still apply, and if you’re looking to turn your Fiverr business into a serious revenue stream, then investing some capital into you’re banner, video, and pitch presentation would be a smart move. A few hundred bucks invested into these three areas could yield thousands, if not tens of thousands in future profits, and purchasing these services from your fellow Fiverr entrepreneurs (especially if they’re already well established) presents a great opportunity for bartering and advertising. The most common sense benefit to this policy is creating repeat customers, but you should also remember that word-of-mouth advertising is by far the most potent form of advertising when it comes to attracting new customers. This leads us to our fourth point. IV) The real money in Fiverr isn’t created through one-time purchases, but through the creation of long-term business relationships that can create dozens of gigs and thousands in potential revenue. Let’s consider a hypothetical situation. You have a Fiverr business where gigs and revenue are uncertain from week to week and it’s a constant struggle to find enough work, or you have a Fiverr business with several long-term business relationships that give them a stable schedule filled with well-paying gigs that help provide some long-term financial security. Which of these two businesses would you like to own? Relationships such as these are usually created by Fiverr sellers who take customer service and customer satisfaction seriously, and who also understand that every customer should be viewed as a potential repeat customer and long-term business partner. V) As your success and reputation grows, start incrementally scaling-up your fees. One of the principle complaints you hear about Fiverr is that people work themselves to the bone, but the money earned just doesn’t match the amount of time invested. That’s because these people aren’t scaling their fees, as well as not understanding that there comes a point where you should start picking quality over quantity. A Fiverr business is just like any other business, especially when it comes to market research and adopting a long-term growth strategy. Study the top earners in your field, and if possible, try to become friends with them. How much are they charging? How much do they earn a month? What was the benchmark they used when deciding to increase their fees without negatively impacting their sales? Conclusion – Be realistic when it comes to your Fiverr business. Yes, there are those that are able to do it full-time, but the majority of sellers look to it as a way to earn supplementary income. That realization should also raise a few questions when drawing up your business plan. How much time are you willing to invest a week into it? How much money would you be happy to make a month? Even better, rather than viewing it as a revenue stream, is there some debt or personal desire that could provide you with the motivation to stick with it? Would you be happy to make enough money a month to pay off your student loans or your utility bills? Is there a major purchase (a trip, a new car, or a new house) for which the proceeds could be saved and squirreled away? While it’s incredibly easy to start a Fiverr business, the fact is the majority of them nonetheless fail. Don’t be part of the statistics!